The (First) Old Burial Ground located on Academy Road in North Andover was established around 1650. This site holds the remains of the founding families of Andover, as well as their descendants. The graves marking the burials are of historic significance to early New England. You can use the database below to search for your ancestor. M. John Barnard died on October 1, 1739. He was 16 years and 3 months old and the son of Rev. Mr. John & Mrs. Sarah Barnard. The Burial Ground is now owned by the Town of North Andover and it is under the jurisdiction of the North Andover Historical Commission. Because of the historical significance of the site locally, the North Andover Historical Society and the North Andover Historical Commission often give tours of the site to interested members of the public and conduct special programs there for North Andover school children. 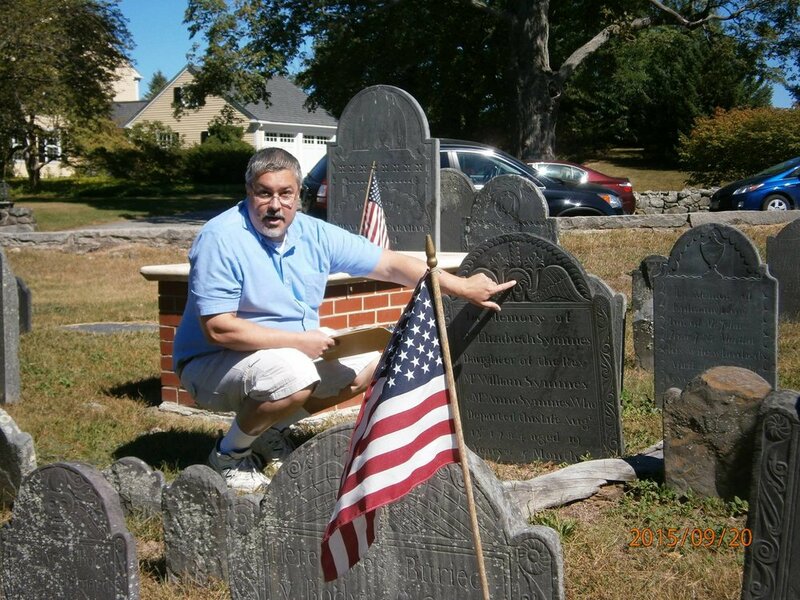 Below is John Glassford explaining the symbolism on the gravestone Rev. William Symmes who was the third owner of the Parson Barnard House. Since the late 1800s, the Burial Ground has been worked on by a number of amateur historians who have catalogued and mapped the site. Over time, there have been discrepancies found and some of the old slate markers have deteriorated to the point of no longer being recognizable. The three organizations that have an attachment to the site, the North Andover Historical Commission, the North Andover Historical Society and the North Parish Church were supportive of this project, which produced a digitized map updated from the old records, along with an on-line database of the known burials, now suitable for public inquiry. 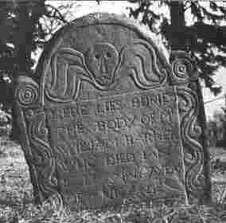 Headstone of Mr. Nehemiah Abbot (1756-1784) in the First Burying Ground. Here lies buried the body of William Barker who died on March 4, 1718. The Massachusetts Historical Commission refers to this cemetery in MACRIS as NAD.800 Old Burying Ground. This cemetery is referred to as GR1 North Parish Burying Ground in the "Vital Records of Andover Massachusetts to the end of the year 1849."